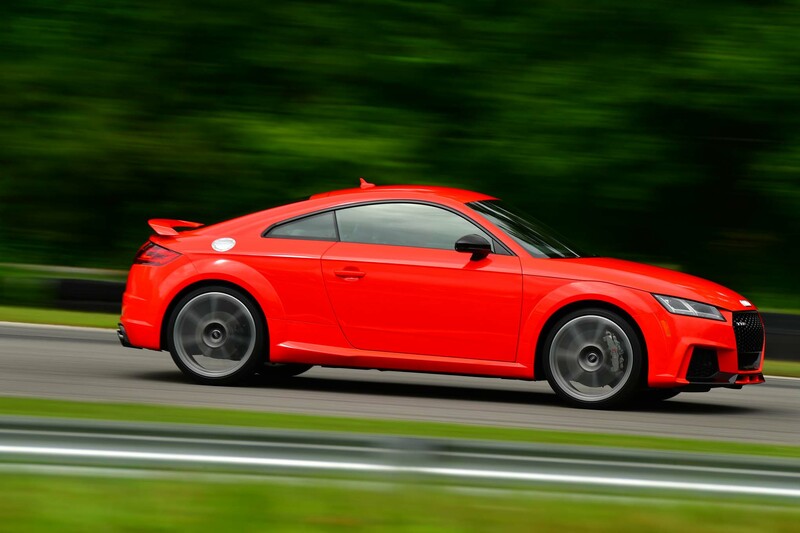 Audi’s little TT has always been a supercar wannabe. It’s an attractive, semi economical option for those that really want something that mimics the R8. Even still it’s been a tried and true option for enthusiasts looking for a decent driver’s car that offers a premium appearance. But now we may be looking at a TT that can actually walk the walk, the newest RS. 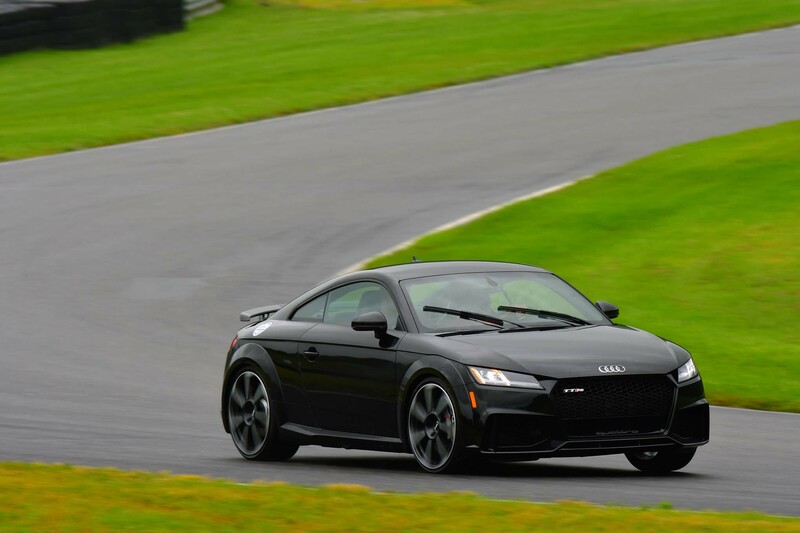 For 2018 Audi is turning the TT RS up to 11, in what could be the wildest TT to date. While the RS we are familiar with is a fine automobile, it lacked the ability to tie its performance together. This resulted in a package that could be brilliant at times, and extremely lack luster at others, with very little notice between the two. But the new ‘Audi Sport’ division has worked their German magic, turning the RS into much more than a near hit. First, we must talk about the new engine. 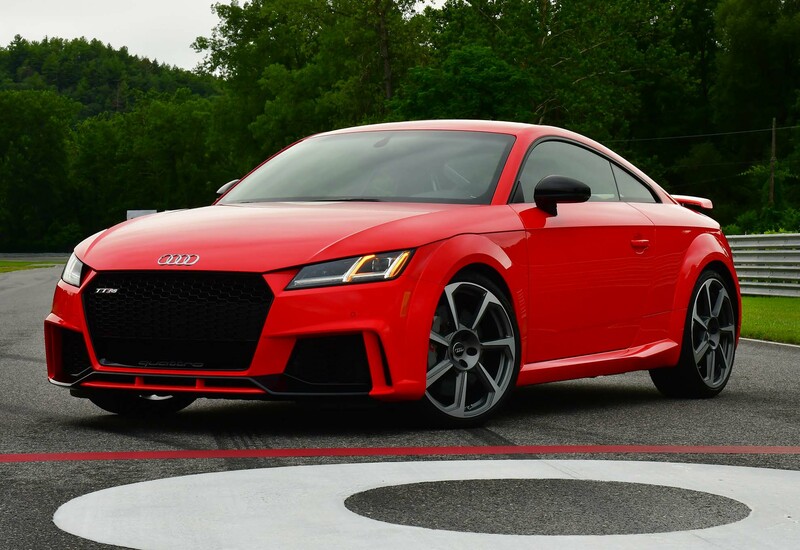 In case you are not aware, the TT RS comes with a very significant package under the hood. 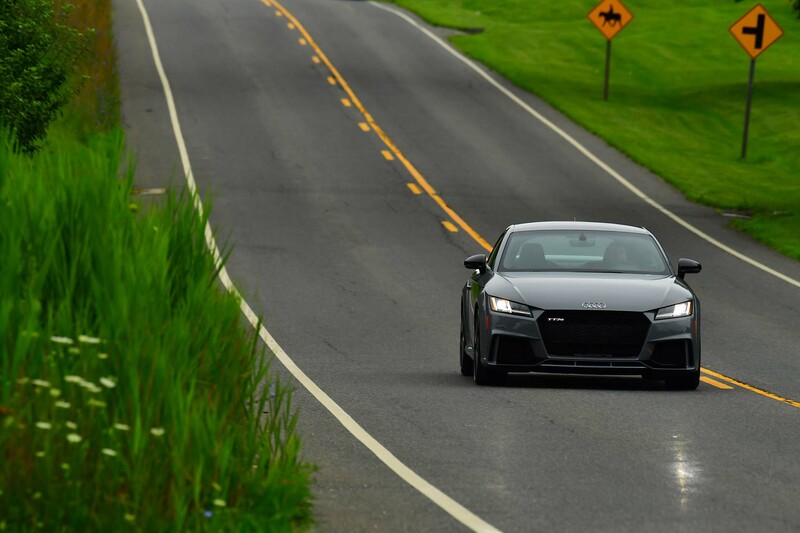 Audi’s famed straight 5-cylinder. Turbo charged of course. The straight-5 had its heyday in the mid-80’s. Audi’s S1 Sport Quattro is as iconic as they get, all thanks to that beautiful 650hp inline-5-cylinder. And while there have been many 5-cylinder engines since then, they have always seemed to be a let down in one way or another. For 2018 Audi is remedying that problem with their newest 2.5-liter. With 400hp and a crisp 354lb-ft of torque, the new engine doesn’t assert itself with massive power numbers. Where it does leap ahead is its new construction. 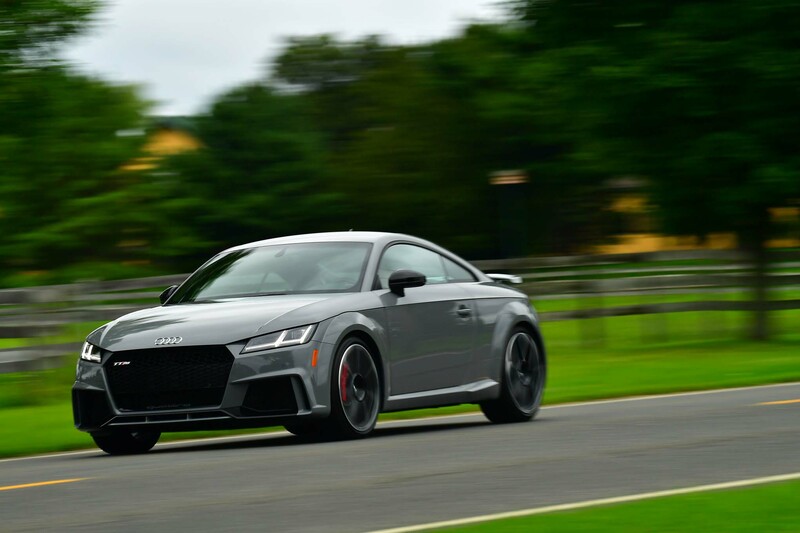 Utilizing an all aluminum block, hollow crank and some magnesium bits, Audi was able to drop over 50lbs from the engine alone. So it’s a little more powerful, and a lot lighter, good start. What really stands out though is the sound. Or should I say, the howl! One of the things Group B rally fans loved was all the sounds. The cars were monstrous, snarling and snapping their way to the finish line. While today’s cars do sound good, they lack that aggressive sound we grew accustomed to. Audi took note of that, making their new engine howl like a scolded Grizzly bear. Okay, that may be a tad of an exaggeration. With emission covering mufflers I doubt you will find anything that sounds that good. But with some minor work, I’m sure this new engine will sound incredible. 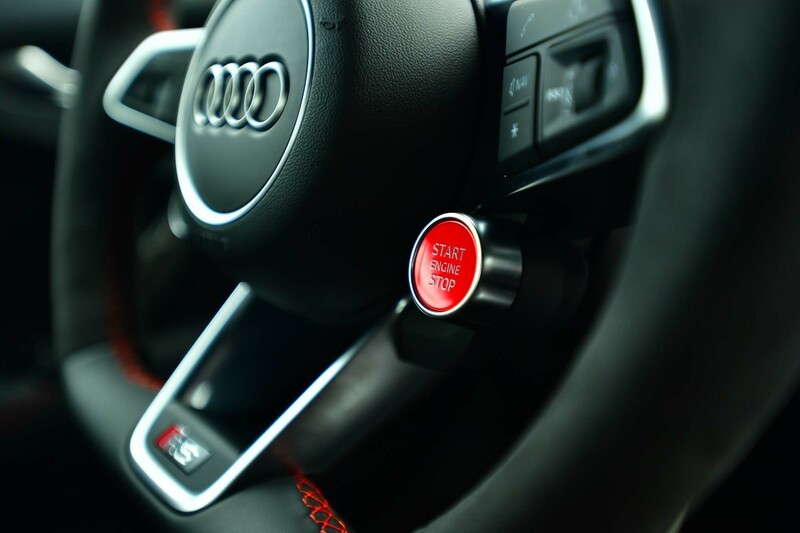 To manage all that 5-cylinder hoopla, Audi saw fit to only equip the RS with a 7-speed dual clutch transmission. The future is now my friends. All is not lost though, that magic automatic gives this TT RS a hidden talent, legs of a cheetah. 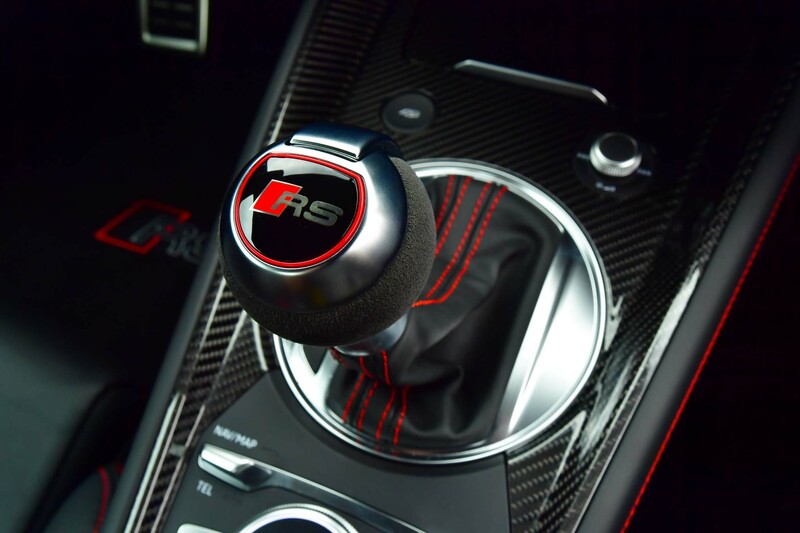 The new and improved RS is claimed to hit 60 in just 3.6-seconds, an astonishing task from the little German. This is of course thanks to its smart all-wheel-drive system and a factory launch control. Still, 3.6-seconds is a sprint worth noting, especially when you consider the Mustang GT is still fighting for under 4 seconds. 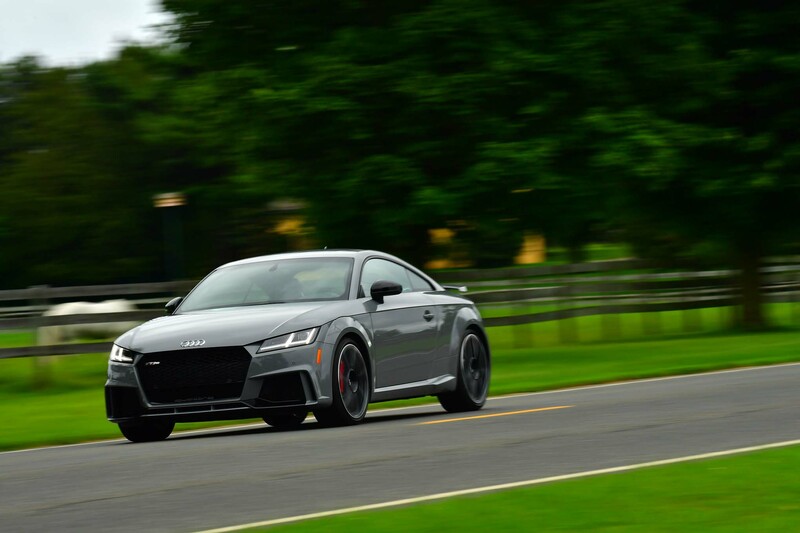 From there the TT RS wows in typical Audi fashion. It’s quiet and comfortable when you want it to be, and rowdy when you don’t. 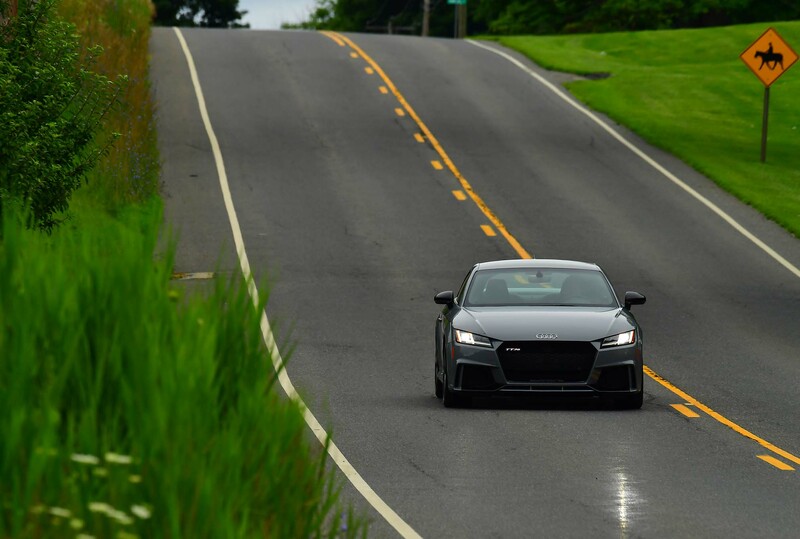 When the road becomes anything but straight the RS sticks like glue. 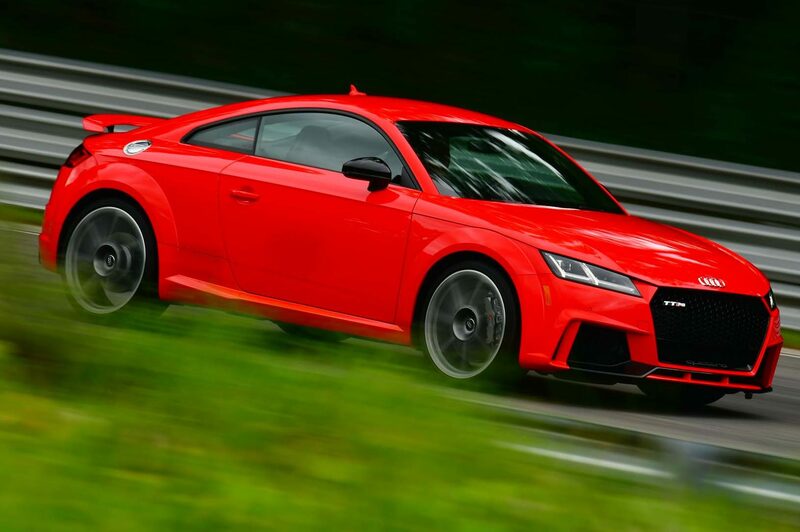 The new RS has a remedy for the TT’s known understeer issues. Thanks to an upgraded Haldex differential the new RS is able to send up to 100% power to the rear wheels, virtually eliminating understeer when pushed to its limits. While that may invoke visions of smoke filled drifts, the reality is that Audi’s Quattro system will pull the RS out of the corner well before the slide begins. That’s the price you pay for an all wheel drive setup as smart as this. From the exterior not much has changed. The RS looks as sharp as ever, but is still distinctly a TT. 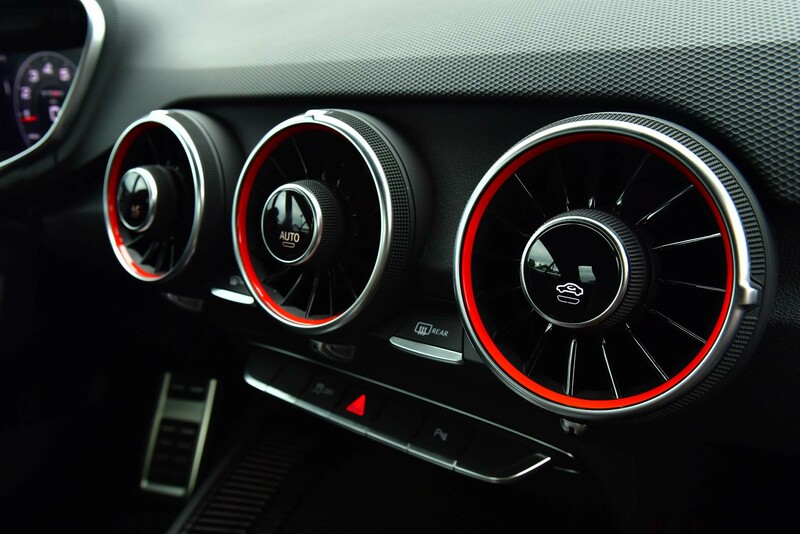 Functional air vents have been added to the front fascia of the RS, allowing for superb brake cooling over the last RS. 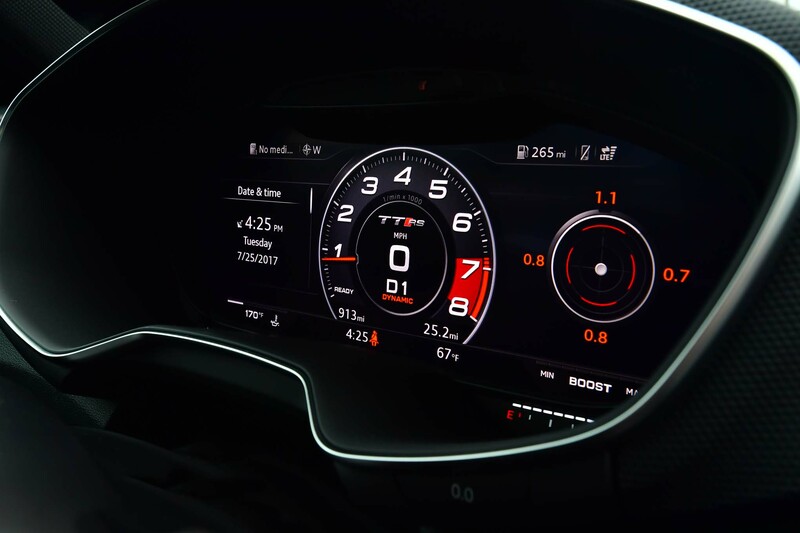 It’s worth noting that Audi is offering a ‘Dynamic Package Plus’ that offers both performance and aesthetic upgrades. While OLED tail lights and a slew of carbon bits are nice to have, the Ceramic brakes are what you should be focusing on. With the ‘DPP’ package you will no longer experience extensive brake fade when the going gets hot. And with a no restricted top speed of 174mph, you will be happy you have that extra stopping power. The interior is the same story as the exterior, featuring minor changes to an already solid package. The seats are new, featuring Nappa leather and 12-way adjustability, all electric of course. It’s a quick flash of luxury living, making the TT feel higher up on the food chain than it really is. That will last until you lay your hands onto the steering wheel, which will violently snap you back into reality. It’s not that it’s bad, it’s just that the wheel is lifted directly from the R8, the car that the TT is no doubt imitating. 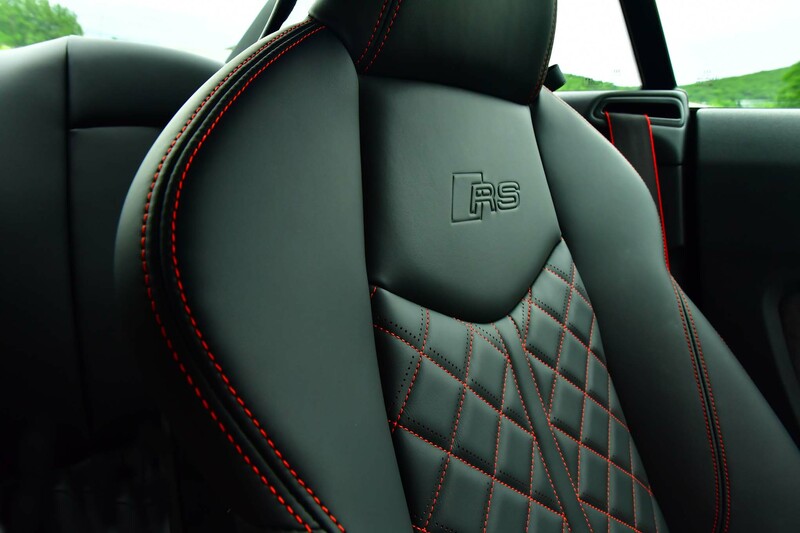 While that in itself isn’t a bad thing, it has been downgraded from the full leather version found in the R8. Even still the steering wheel is well suited to the rest of the interior, fitting the mini supercar bill. 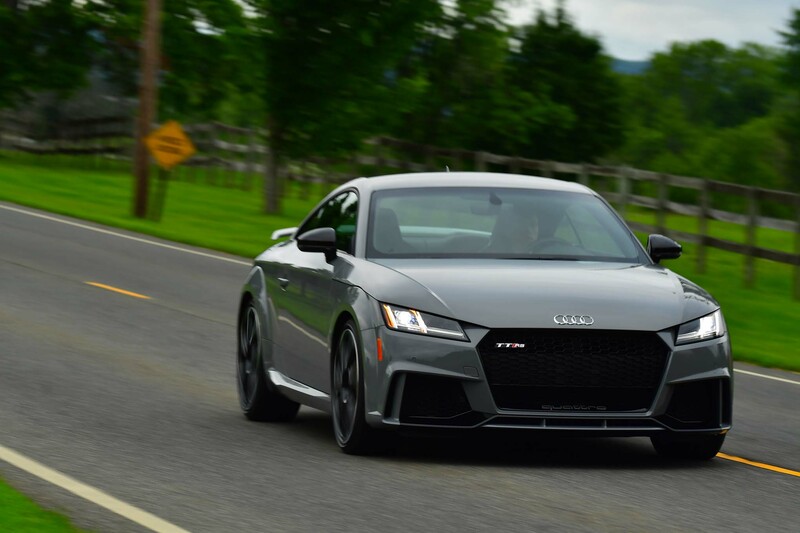 At $65,000 the TT RS isn’t cheap, but it does fit in well with its competitors. The Porsche Cayman S is the first to come to mind. And in that comparison, the RS stomps the poor Cayman in both price and performance. Factor in the rear seat and you have a car that is not only fun, but also functional. The 5-cylinder exhaust note easily edges the RS past the S model Cayman, while falling just short of the famed GT4. 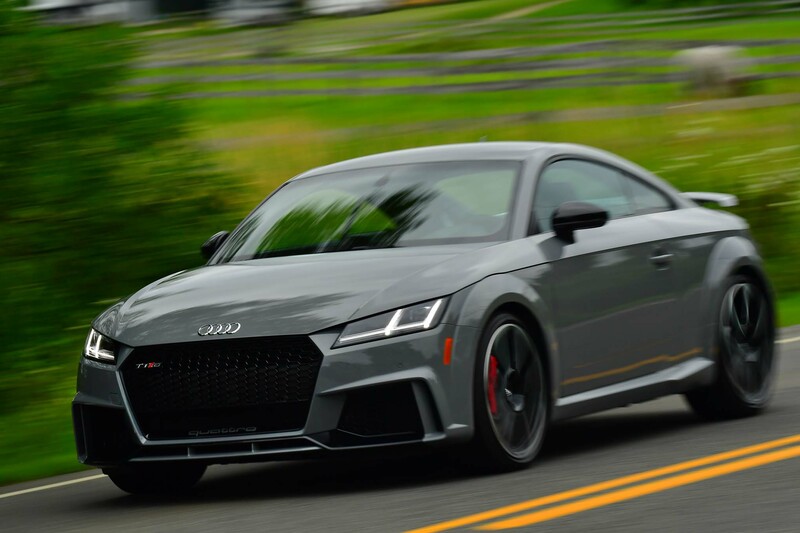 Overall the 2018 TT RS is shaping up to be one hell of a car for the money, you just have to come to grips with the fact that it will never be an R8.